An energy company's plan to drill more than 1,400 natural gas wells in northeast Utah's Uintah Basin could be tripped up by an emerging air pollution problem that has affected other densely developed oil and gas fields across the Rocky Mountain West. The concern is wintertime ozone, a problem that federal regulators discovered for the first time in the basin just this year. If the phenomenon cannot be controlled, it could force Denver-based Gasco Energy Inc. to scale back plans to drill across 206,826 acres of mostly Bureau of Land Management property. Ground-level ozone pollution, which is linked to respiratory diseases like asthma, is a well-known summer pollution problem, stemming from the mixing of auto and industrial emissions in sunlight and heat. But federal regulators have discovered an unusual winter weather pattern in the Uintah Basin that causes ozone concentrations to reach potentially dangerous levels in January, February and March. The pattern is marked by stagnant air that allows emissions to collect in the lower atmosphere and then be converted into ozone by sunlight and heat reflecting off snow on the ground, said Stephanie Howard, a BLM environmental coordinator and the agency's project manager for the Gasco proposal. Air pollution monitors recently installed in the Uintah Basin measured ozone concentrations exceeding federal health standards more than 68 times in the first three months of 2010, according to U.S. EPA data. On one day in January and two days in February, recorded ozone levels were nearly twice the federal health standard of 75 parts per billion. “We think these ozone issues in the Uintah Basin call into question the justification for the BLM moving ahead to analyze or approve these sorts of projects,” said Steve Bloch, conservation director of the Southern Utah Wilderness Alliance. The future of oil and gas development in northeast Utah's Uintah Basin could be determined in part by the persistence of wintertime ozone, a recently discovered phenomenon that regulators have linked to emissions from wells. Click the map for a larger version. Map courtesy of USGS. The winter ozone phenomenon surprised BLM, which this week issued a draft environmental impact statement (EIS) identifying hundreds of existing oil and gas wells in the basin as the primary cause of the ozone pollution. The draft EIS is scheduled to be published tomorrow in the Federal Register, kicking off a 45-day public comment period through Nov. 15. Gasco's project could still be permitted, though, since federal regulations require three consecutive years of monitoring data before a region can be deemed a violator of federal pollution standards, also known as National Ambient Air Quality Standards. If the area were declared an ozone violator, EPA would mandate an emissions reduction plan to improve air quality by a certain deadline. But BLM is not waiting for such a violation to occur. Rather, the agency's EIS includes measures to ensure the Gasco project does not exacerbate wintertime ozone, including possibly reducing or prohibiting drilling activity during the winter months. "We're very anxious to see what the numbers are in January, February and March," Howard said. "We're holding our breath to see what happens." Further complicating the Gasco proposal is EPA's expected tightening of the ozone health standard by the end of the year. EPA has proposed revising its "primary" health standard for ozone so that a region would violate the Clean Air Act if ozone concentrations reached between 60 and 70 parts per billion averaged over an eight-hour period. The agency has also proposed a "secondary" ozone standard aimed at protecting vegetation and sensitive ecosystems, including parks, wildlife refuges and wilderness areas (Greenwire, Jan. 7). While a tougher ozone health standard would have its most immediate effect in urban areas, where motor vehicles contribute billions of tons of ozone-forming pollutants annually, the odorless gas has become a growing problem in remote areas as well, especially where oil and gas producers have sunk thousands of wells into the ground, resulting in releases of ozone precursors nitrogen oxide (NOx) and volatile organic compounds (VOCs). The stakes could be especially high in Utah, one of the nation's fastest-growing states and a growing hub for oil and gas development, particularly within the Uintah Basin. 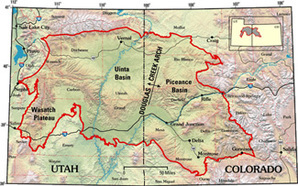 In fact, the Gasco Energy project is the smallest of four Uintah Basin drilling proposals currently under review by BLM. Collectively, these four projects could result in the drilling of more than 17,000 new natural gas wells across hundreds of thousands of acres of federal land over the next three years. The largest is the Greater Chapita Wells Natural Gas Infill Project, which would place up to 7,028 wells across more than 40,000 acres of mostly BLM land. Next is the Greater Monument Butte plan, proposed by the Newfield Exploration Co. It calls for drilling 5,750 wells across 119,850 acres of mostly federal land. And finally, the Greater Natural Buttes Project, proposed by Kerr-McGee Oil & Gas Onshore LP, could result in drilling as many as 3,675 wells on 162,911 acres. While drilling in the Uintah Basin has been going on in some form since the early 1900s, with some active federal leases dating back to the 1950s, Howard said better technologies and drilling techniques have attracted companies looking to access gas reserves at much greater depths than before. "That's across the West. We are now able to develop more American oil and gas reserves that five, 10 years ago we didn't know how to," said Kathleen Sgamma, director of government affairs for the Denver-based Western Energy Alliance, an industry trade group. Sgamma, however, questioned the accuracy of the ozone readings in the Uintah Basin, saying the two monitors that registered high wintertime ozone were "faulty," and the readings did not pass EPA's quality assurance standards. "That data cannot be used in determining the attainment status" of the region, Sgamma said. Howard, however, disputed the assertion that the numbers were faulty, saying they had been vetted by EPA and posted on its website. "I'm pretty sure that if the readings were faulty the EPA would not have published them," she said. "My understanding is those numbers are correct." Faulty or not, Sgamma said the readings provide enough incentive for regulators and the industry to work together to ensure that emissions of ozone precursors stay low. She also stressed that Uintah County, where the project would be located, currently is in compliance with federal health standards for ozone. "Environmental groups are certainly trying to use the faulty readings in the basin as a means to stop oil and gas development and the associated jobs," Sgamma said. "But the bottom line is that economic activity does not need to be stopped in an area that remains in compliance for ozone." But the Uintah Basin is not the only place where oil and natural gas drilling activity is associated with high wintertime ozone. In Sublette County, Wyo., wintertime ozone attributed largely to oil and gas production in the Jonah Infill and Pinedale Anticline gas fields could lead to Wyoming's first violations of EPA air quality standards, according to state officials. Federal maps also indicate that counties in the natural gas-rich Powder River Basin in northeast Wyoming could also violate federal air quality standards if EPA toughens its ozone health standard. Wyoming Gov. Dave Freudenthal (D) asked EPA last year to designate Sublette County and portions of two other neighboring counties in the state's southwest corner as violating current ozone health standards (Land Letter, March 19, 2009). Wells in those two fields produced 7.6 million barrels of oil and 1.1 billion cubic feet of natural gas in 2008, according to state statistics. Between 2000 and 2008, the number of annual new oil, gas and coalbed methane drilling wells in the region increased almost threefold, from 350 a year in 2000 to 925 a year in 2008, according to state figures. More than 2,600 new wells were drilled in Sublette County alone during that time. An ozone monitor in southwest Wyoming began recording high ozone levels in 2005, and a technical analysis of air quality in the region conducted last year by the Wyoming Division of Air Quality found that 94 percent of VOCs and 60 percent of NOx emissions "are attributable to oil and gas production and development." But last winter the region's ozone levels did not exceed federal ozone standards, in part because low wellhead prices significantly slowed production. Industry officials attribute the drop in emissions to efforts by drillers to reduce emissions by up to 80 percent in the Pinedale Anticline region. Those measures include using cleaner-burning engines in machinery and piping oil and gas to reduce truck traffic in the field. Meanwhile, BLM will continue to study wintertime ozone levels in Uintah Basin. Howard said the agency would likely allow Gasco to drill some wells before they have collected the three years of data needed to verify that the basin has an ozone problem. Jeremy Nichols, climate and energy program director for WildEarth Guardians, said that would be a big mistake. "BLM needs to understand they have a responsibility here, and they do need to start limiting operations and development activity when it looks like emission levels are going to rise," Nichols said. "The only way is to limit operations and limit development. They are going to have to stop rubberstamping all of these projects that are put in front of them." Click here to read the draft EIS.